There is a certain complacency, perhaps arrogance, among commentators in the United States concerning the prospects for violent uprisings or mobilizations in the US. It is widely held that violent uprisings, coups, oppositional movements, will not, even cannot, emerge or take hold in the United States. 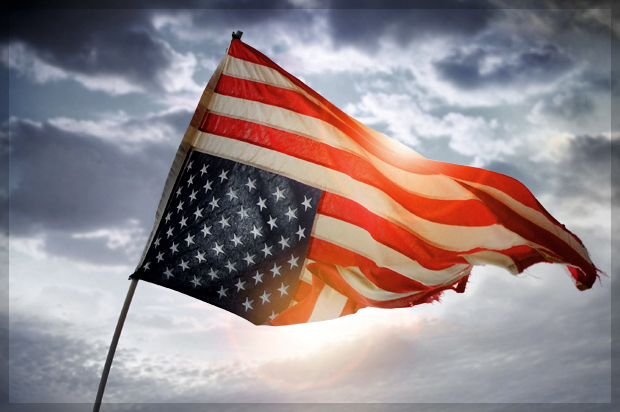 America is viewed as a stable system with democratic checks and balances and a civil make-up mitigating against such dramatic eruptions in the body politic. Furthermore, truly oppositional movements are viewed as being too small, too marginal, or too trivial to pose a real challenge to the liberal democratic order of things in the United States. There are some recurring factors that historically appear as what might be preconditions for dramatic social upheaval and change. These are extreme economic inequality; significant, major economic or political crisis or shock, usually unexpected; a middle strata that feels threatened or is experiencing economic threats (Judson 2009, 174). Conflict can be triggered by a dramatic event such as a coup d’état, riots, a terrorist attack, etc. (Judson 2009, 174). Responses to these issues are also important. Does the middle strata mobilize against specific scapegoats (migrants, minorities, unionists, etc.) or focus anger at a ruling elite? 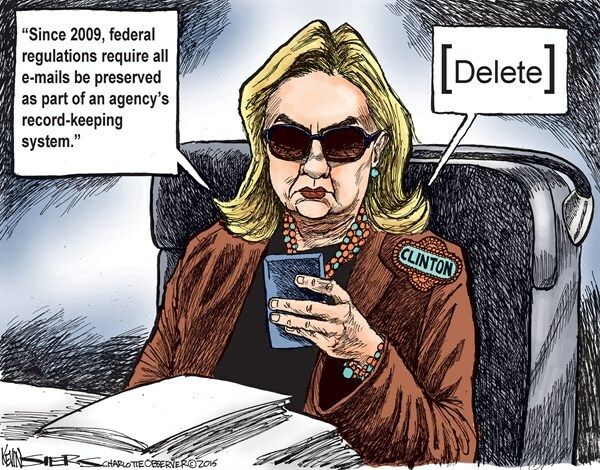 Does the government lose legitimacy or offer a believable remedy to the problems? Does it maintain legalistic means or resort to force and violence? Conditions typically giving rise to upheaval are present throughout US society. Millions have lost jobs and others the prospect of finding jobs that pay a sustainable living wage and/or offer some financial security. 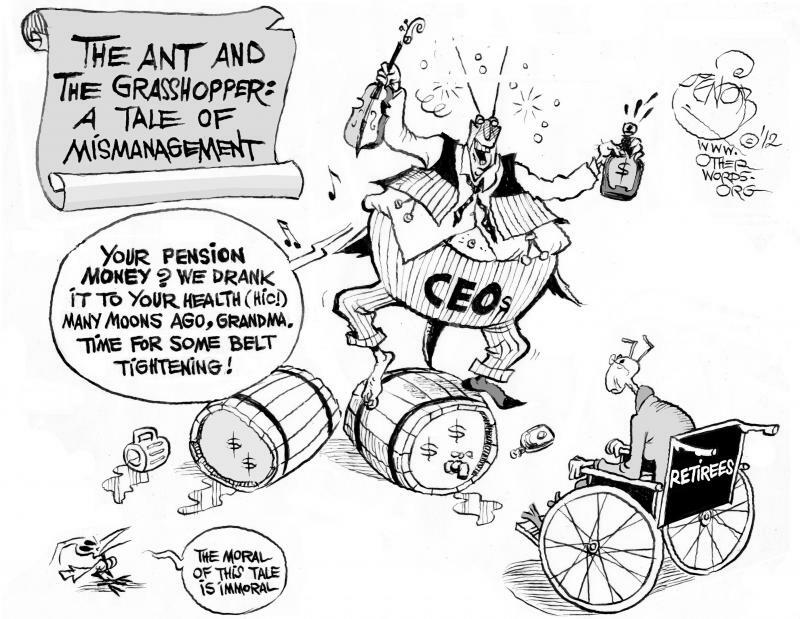 Millions have seen savings vanish or pensions, deferred wages, decline or evaporate. Millions have lost their homes and more are facing foreclosure or eviction. Large sections of the population are desperately in debt. Numerous writers and commentators have sensed that growing inequality in the United States raises an existential challenge to the future of America and it social and political systems. Inequality in the United States has reached levels that have historically preceded political upheaval and rupture. America has long been a plutocracy ruled by those one percent in whom wealth and power are concentrated. The group sees its incomes rise regardless of which of the two parties of capital runs Washington at any given time. In 2005 the top one percent of Americans (those with incomes over $348,000) received their largest portion of national income since 1928 (Tritch 2006). From 2003 to 2004 the real average income for the top one percent of households (those with income over $315.000) grew by almost 17 percent. That top one percent enjoyed 36 percent of all income gains in that period (after enjoying 30 percent in 2003) (Tritch 2006). The current context in the US is one of extreme economic inequality coupled with a middle strata (middle class) that is increasingly impoverished and increasingly feels imperiled. In 2008 the Wall Street Journal reported that upward mobility had remained stagnant for the past two decades (2008). Debts are equal to or more than annual income for the average family in the United States. In the New York Times David Brooks suggested that the economic decline was producing a new social layer—the formerly middle class. Brooks suggested that the alienation and political reaction associated with the development of this new strata would produce the next major social movement (Brooks 2008). This movement could be progressive or regressive and reactionary. The form moved depending on social circumstances. Economic inequality is recognized as the greatest predictor or precedent of social rupture or revolution. Economic inequality and the social divisions that accompany it render societies vulnerable to the effects of disruptive social forces such as militant right wing movements. 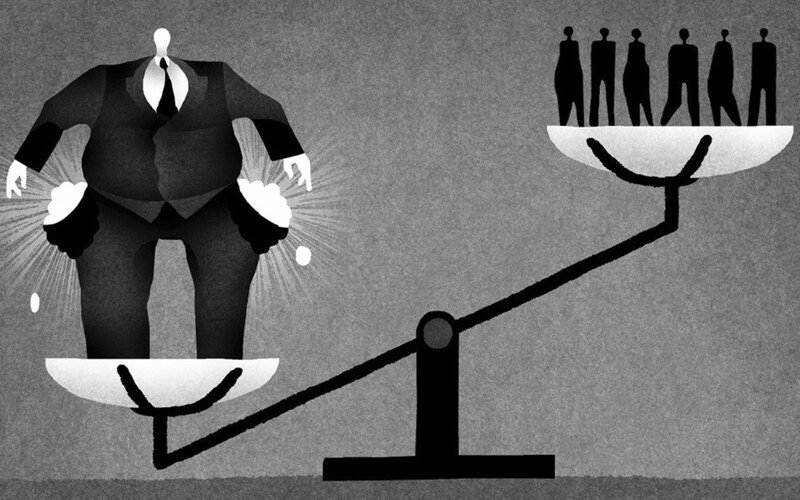 In the present day United States, economic inequality has reached disastrous levels. The activities of organized extremists could render flammable tensions explosive. The social pressures could be further sparked by a flashpoint event such as terrorist attack or state action, such as a clampdown on a popular oppositional group or movement. Some point, with amnesia, to a supposed lack of domestic terrorist violence and terrorist groups in the US enacting street level violence as a possible counter to the possible emergence of fascism. Yet, as the great US historian Richard Hofstadter wrote, this is a matter of repression in the national consciousness (quoted in Rappaport 2008, 167–168). Examples of domestic terrorism range from the Sons of Liberty, through the Klan, night riders, up through the Michigan Militia to the Minutemen and Patriots today. The examples in the US context have historically been rightist in character. Increasing anger and misery in the present period can create a climate more sympathetic to terroristic reactionary violence—to fascism. As in some Republican campaign events in 2015 and 2016 groups may feel emboldened to act aggressively or violently toward representatives of scapegoated groups. If popular support for such aggression increases, the opportunity for larger expressions of fascist aggression may develop. For some time now, commentators have noted a “populist rage coursing through America” (Rich 2009). The consumerist desire for immediate or instant gratification can further prepare a ground for receptivity to the appeals of a demagogue. A consumerist ethos is conditioned to look for short term, easy answers or satisfactions. These are the ready-made offerings of the demagogic leader. And this clarifies why pundits and political campaign opponents miss the point when they clamor for specific answers during debates or bemoan the lack of clear or consistent policy statements. Thus one might reflect on the quickly mobilized support for a blustering opportunist claiming to “Make America Great Again” by getting tough on a spectrum of scapegoats while standing up to political elites (and erstwhile friends and golfing partners). From a reading of the vast historical and social science literature on social change, Bruce Judson identifies five significant risk factors for dramatic social change. The first is the distribution of wealth and the gap between rich and poor in the society. The second is the impact of political or economic shocks. Third is the failure to meet rising expectations or hopes. Fourth is a broad perception of social unfairness. And finally the fifth factor involves the history and effectiveness of prominent social institutions. Historians and philosophers from Plutarch and Aristotle have noted the part played by inequality in political rupture. Plutarch is said to have asserted, “An imbalance between rich and poor is the oldest and most fatal ailment of all republics.” For Aristotle, as for sociologists like Durkheim and Tönnies, economic disparities or divisions break apart relations of cohesion and connection in society. This from someone who was part of a regime, that of Bill Clinton, that imposed neoliberal austerity policies, including massive cuts to social assistance programs, a dismantling of welfare really, and which brought in the anti-working class, pro-capital, North American Free Trade Agreement (NAFTA) as well as fundamentally deregulating Wall Street. All of these have played significant parts in the expansion of wealth inequality in the United States. One outcome of income disparity is the active garrisoning of the elites in insulated and secured enclaves (social and geographical) separate from the rest of society. The wealthy seclude themselves in gated neighborhoods (not communities) with all of the amenities denied to the majority of the society’s population. Private schools, top universities, excellent health care, clean and safe drinking water. Clean environments. These garrison spaces are physically sealed off from the rest of society by private (and often public) security and surveillance. This positions them as less connected to others not like them and without regard for public services that they do not need but which others depend on (public health care, public schools, public transit, public post-secondary education, public parks, unemployment insurance, social assistance, social housing, etc.). This plays out in opposition to taxation for public services (apart from support for public money for police and military expenditures which they view as essential for their own security and thus as the main aspects of governance). Their wealth is put to fund neoliberal, tax-cutting, deregulating, social austerity pushing politicians who cut programs of the working class and poor and impose restrictions and controls on the poorest in society. The result is a further redistribution of wealth upwards—taking supports from the working class and poor and investing in social spending that further benefits capital and the wealthy (tax cuts, corporate grants, deregulation, policing). This increases social inequality further and sharpens tensions in society. Typically it renders the deprived more deprived. The American Dream in the US is a myth that has successfully worked to secure middle strata loyalty and allegiance to an unequal system of broad maldistribution of wealth and resources. Yet upward mobility in the United States is much lower than it is in most European countries and Canada (Blanden, Gregg, and Machin 2005). If a larger proportion of middle strata believers comes to see this reality and the American Dream as a false myth, despair, frustration, and a sense of betrayal can contribute to a desire for political change of a vengeful character. 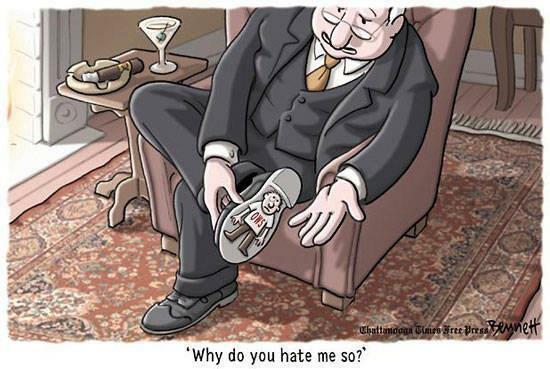 Relative deprivation and status frustration theories in sociology and criminology have long pointed to the role of perceptions of economic injustice or status inequality combined with economic inequality or poverty in contributing to anger and resentment within stratified societies that claim to be democratic or meritocratic. These approaches suggest that it is not absolute poverty or misery that is key. Rather it is the level of dissatisfaction or frustration one feels relative to others in their social environment or relative to social expectations (or promised social rewards). Perceptions and contexts can matter as much as or more than specific experiences. Someone in the middle strata may become frustrated and perceive themselves as being derived even though they are materially better off than many in their society or globally. Their frame of comparison is members of their own strata or those doing better, not those doing worse. 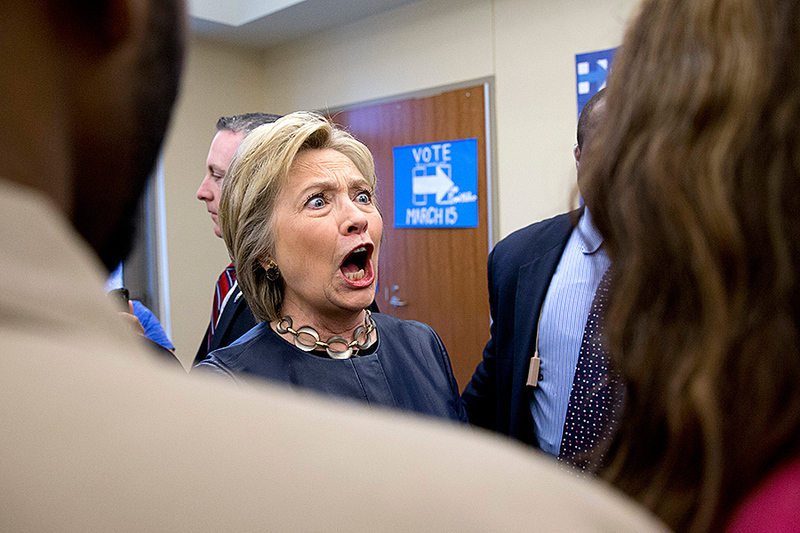 These feelings of frustration can be manipulated where political actors make unfair and opportunistic comparisons to members of specific groups (migrants, religious minorities, welfare recipients) who are portrayed as doing better as a group or as being unworthily or unfairly benefitting from perceived social privileges (through social programs, migratory “que jumping,” affirmative action policies etc.). 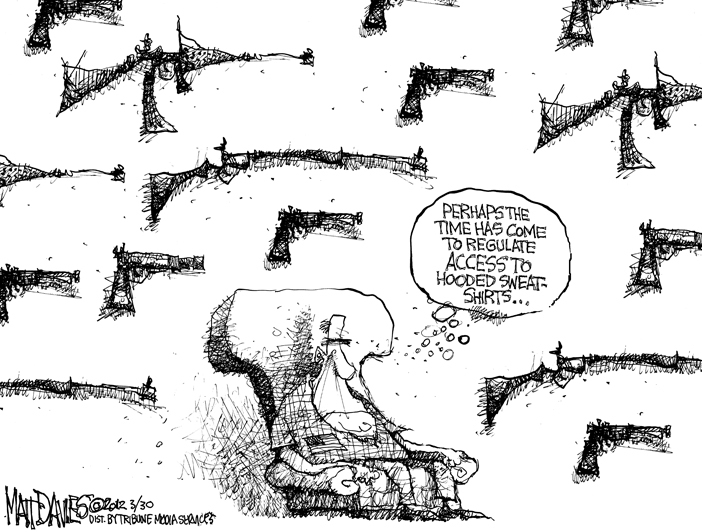 Political repression by ruling governments plays a regular role in periods of dramatic change. Recent attention to police violence, including the killings of civilians, shows that repression and use of armed force by the state is a regular feature readily available within liberal democracies. For the most part this violence is deployed against minorities and political opponents. Should such violence be deployed against more privileged sectors—white, middle strata, conservative males—it could contribute to the growth of armed defense movements such as militias or so-called patriot groups which could revive broader support than usual. In this context, a US Army War College report in 2008 suggested that an economic crisis in the United States could lead to mass civil unrest which would require military intervention to restore order (Washington Valdez 2008). The year 2008 marked the first time in which the United States has come to deploy an active duty regular Army combat unit in full-time use to deal with civil unrest inside the country (National Terror Alert Response Center 2008). The use of state violence against unarmed minorities while restraint is shown by police facing armed right wing groups could send the message that such groups have legitimate grievances around which they are organizing in legitimate or at least tolerated ways. Domestic regimes are frequently imperilled by unpopular foreign military adventures. This is particularly true when the domestic public become resentful over expenditures in such adventures at a time when they are experiencing economic insecurity or risk. The question of government competence could be quickly raised in the event of a larger scale terrorist attack. One can point to the rise in racist anger in response to even smaller assaults. A dramatic shock, whether economic or political is often a precursor to dramatic social change. This could well be a terrorist attack in the context of a national government seen to be soft or conciliatory in the popular imagination. A shock in the context of a lack of trust in the existing government (entirely justifiable), and in the absence of effective progressive mobilization, can provide an opening for a demagogue promising security, vengeance, or setting things “right” (against a liberal democracy seen to be impotent, or passive, or gridlocked, or “politically correct”). Based on the percent of income gained by the top ten Percent of US families, the United States is now at the highest level of economic inequality in the nation’s history. The United States has moved beyond the levels of economic inequality that a society can typically sustain. Earlier this century the United States reached a signal, infamous moment. In 2006, the top earning ten percent of US families received 49.3% of all US household income, including capital gains. This compared with the much lower 34.2% of the nation’s total income received by the top ten percent in 1979 (Saez 2008). In 2006, economic inequality in the United States reached the highest levels since systematic accurate records became available in 1913 (Judson 2009, 51). These stark realties show the potent impacts of decades of neoliberal social and economic policies and capitalist restructuring. Not surprisingly perhaps the great increases ratcheting up social inequality in the United States have developed over the last 35 years, in the period initiated with the election of Ronald Reagan as President and the imposition of Reaganomics, the voodoo economics of neoliberalism which has become something of an article of faith for politicians of various stripes. In 1979 the economic top one percent of Americans received ten percent of total income for the nation. By 2006 this number had jumped to more than 22.8 percent (Saez 2008). Even more the top one percent of families in the US take home one-quarter to one-fifth of all household income (Judson 2009, 52). Judson concludes that already the US has turned into an economic oligopoly (2009, 53). In the United States economic inequality had peaked in the 1928–1929 period before the Crash then declined through the low points reached between the late 1950s and late 1970s. The decline in inequality reached the low point at which the top one percent received 8.9 percent of the nation’s income in 1976 (down from 23.9 percent in 1928 and 11.3 in 1944). The upward thrust began, notably, under Reagan starting in 1980. It reached the point in 2006 at which the top one percent had risen to over 22.8 percent of all household income (Judson 2009, 53). Bruce Judson notes that the peaks of inequality in 1929 and 2008 preceded the stunning economic crashes that shook the system in the US. Broad economic inequality goes hand in hand with political instability and disruption. Conflict is a consistently appearing outcome in historical examples. Current conditions of economic inequality have resulted in a range of crises including the Crash of 2008. The effects of that crash are not yet played out. Between 1944 and the 1970s the top ten percent of households accounted for around 33 percent of the nation’s total income. With the 1980 election of Reagan and the imposition of voodoo Reaganomics the total income gained by the top ten percent began the steady rise that took it to levels not seen since the decadent year of 1928 by 2006. That year the top ten percent claimed over 49.3 percent of the nation’s income, more than in 1928 (Saez 2008). These numbers represent an extreme concentration of wealth. Yet incredibly if one looks at the top one percent the concentration is even more extreme. In 2006 the top one percent of Americans received around 22.8 percent of all income (Judson 2009, 109). That is a percentage only surpassed, again, in that precipice year of 1928 when the top one percent received about 24 percent. Between 1952 and 1975, pre-Reagan, the top one percent received around nine to eleven percent of total household income in the United States (Judson 2009, 109). Incredibly, the figures show even more concentration if one looks at the top 0.1 percent of American households. In that case the top 0.1 percent gained 11.6 percent of total income for all US households in 2006. That compares with 2.7 percent in 1978, right before Reagan (Judson 2009, 110). Numerous studies pinpoint 1979 as the fundamental turning point. Before Reagan, the United States was significantly more equal. Even more, there has emerged a strong rift between economic growth and productivity and workers’ incomes. Productivity is the value in income produced by each worker (after adjustment for inflation). Increases in productivity are not leading to growth in wages and living standards for workers. Between the 1940s and the late 1970s income shares among different groups in the United States increased at closer rates. With the 1980s income gains occurred mostly for the highest earning Americans (Judson 2009, 113). While productivity of the average worker in the United States has increased by almost 50 percent since 1973, it seems clear that workers have gained virtually nothing over this period (Krugman 2007, 24). Wealth is the most significant means of inequality. It provides a bulwark against crisis. It also provides a basis for influencing political activity in liberal democracies. The distribution of wealth in the United States is even more divergent than the distribution of income. In 2004, Edward Wolff of New York University reported that the top 20 percent in the United States owned around 85 percent of the nation’s wealth. 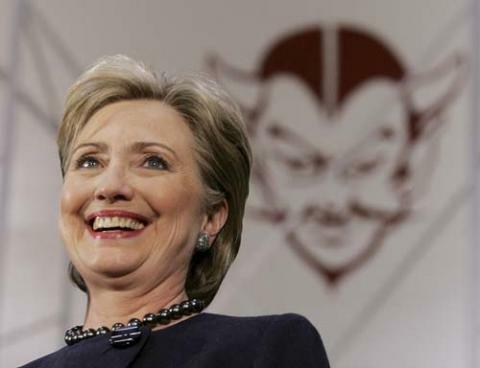 The top ten percent held 70 percent of all of the nation’s wealth. Even more the top one percent of all households held more total wealth than the bottom 90 percent of households (Wolff 2007, 2). A 2008 study by the OECD reported that of 24 countries examined, the United States had the highest income inequality outside of Mexico and Turkey (BBC News 2008). The 2007 Census Bureau report put the Gini coefficient for the US at .463, over the international warning line. This put the US Gini scale in the neighborhood of Sri Lanka and Mali (DeNavas-Walt, Proctor, and Smith 2008, 7). Between 1978 and 2006 the top 0.1 percent enjoyed real income gains of more than 235 percent. For the top one percent the gain was 90 percent. For the United States the median real income only increased by 13 percent. The UN-Habitat State of the World Cities Report 2008/2009 notes that US cities like Atlanta, Washington, Miami, and New York have levels of inequality similar to Abidjan, Nairobi, and Santiago (2008, 51). These levels of inequality lead to social separation and a disintegration of broader social bonds. Economic inequality affects social trust. As inequality increases so too do levels of mistrust. This can contribute to scapegoating as social mistrust attaches to specific groups who are constructed as symbols of mistrust. All levels of trust seem to be reaching 30 to 40 year lows in the United States (Judson 2009, 185). One level is generalized trust within society. Generalized trust has consistently decreased through the period of growing social inequality in the US. The General Social Survey which provides a biannual report of American social values and an overview of social trends concludes that between 1972 and 1980, the year of Reagan again, the percentage of people who agreed with the sentiment that “most people can be trusted” (as opposed to the statement that “you can’t be too careful in dealing with people”) remained relatively constant (Judson 2009, 185–186). This despite the experience of Watergate and the opportunistic and cynical pardoning of Richard Nixon by Gerald Ford in the intervening period. Between 1980 and 2006, however, the percentage of people who generally trust others decreased from 44 percent to 32 percent. These were the lowest levels of trust recorded at any point in the history of the survey (Judson 2009, 186). According to commentator Eric Uslaner in The Moral Foundations of Trust, based on a study of a range of surveys done over several decades: “If you believe that things are going to get better—and that you have the capacity to control your life—trusting others isn’t so risky” (2002, 33). Economic crises can spark further drops in trust. 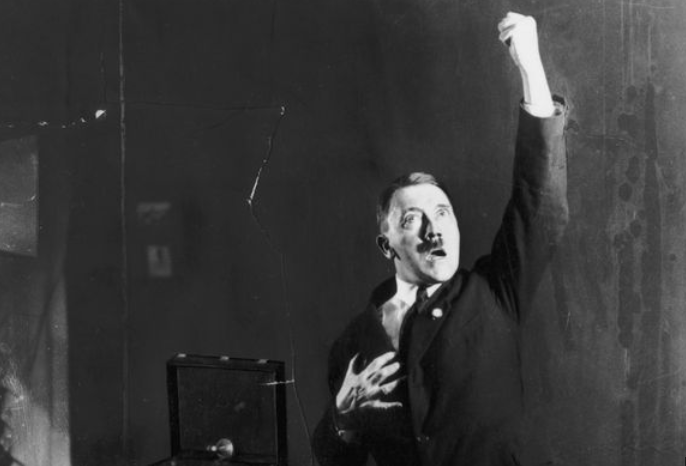 In terms of a contemporary fascism it is likely, as in Germany in the 1930s, that the impetus will come, not from the industrial working class and poor, but from an increasingly disaffected, alienated, and imperiled middle strata. Uprisings emerge where these groups come to distrust the dominant system of governance. The American Dream is a middle strata fiction. As more middle strata members feel that dream slipping away, the fiction crumbling, for their children, frustration can shift to resentment, a sense of having been lied to, anger, and violence. The middle strata anger can develop a dual sense of resentment. One is focused, rightly, on the ruling classes and economic and political elites who have accumulated increasing wealth, resources, and power while the middle strata has experienced a squeeze or decline. The other is focused, vengefully, on the poor and less fortunate who are viewed as unfairly benefiting from government largesse based on the labors (or taxes) of the middle strata rather than the fruits of their own labors. Middle strata frustration can move to anger and aggression in a context of crises (financial, terrorist, etc.). This anger can be funnelled toward cultural difference and scapegoats representing middle strata fears and, politically manipulated, social phobias—from undocumented migrants to religious difference (see Ramadan and Shantz 2016). The period of Obama’s two terms in office has perhaps further prepared the ground for a fascist turn. Obama has campaigned on and held out the promise of hope for the middle strata. Yet his administrations have failed to deliver on this hope. The mix of rising expectations met with unmet gains may have contributed to the sense of a lack of alternatives and faith in the system that has found expression in the rise of, say, a Donald Trump, or the growth of militias and paramilitaries set to do it for themselves and prepared to take things into their own hands through force. Economic crisis further plays into brooding fears which can seek and find ready scapegoats. Economic crisis can create or exacerbate social phobias which can be manipulated by governments and hard populist figureheads alike. The rise of the Donald Trump campaign for Republican Party leadership is an example of how this can be played and spread rather quickly in a mass social media environment. Relatedly, anger can grow and explode beyond the usual safety valves of protests or demonstrations. Established government can quickly become a target (legitimately and rightly so) as a cause or contributor to crisis or because of mishandling of crisis that openly favors specific groups (like investors, state allies, etc.). While OWS has received much attention, the prospects for rightist extremism loom in relation to shifts in perceptions among the middle strata that large numbers of the middle strata feel they are losing ground or not realizing expectations (and see no resolution offered in the OWS manifestations). Attempts by the middle strata to cling to the American Dream are underwritten today by record levels of debt. Economic inequality, job loss, declining wages have been matched by rising levels of debt to family income. In 1979 debt was 74 percent of household income. In the first quarter of 2008 total household debt was at 132 percent of personal disposable income (Weller 2008). In 1981 personal spending was at 88 percent of disposable income. By 2008, it was about 100 percent (Kedrosky 2009). High levels of debt along with economic crisis, declining income, unemployment, growing costs, rising home payments, and rents create an explosive context. Job loss or medical emergency can mean instant disaster for families. A 2006 study concluded that 78 percent of middle strata families lacked net assets (all assets except home equity and minus debt) to sustain three months with spending at three-quarters of current expense levels if they lost their source of income (Wheary, Shapiro, and Draut 2007). They lack the financial security to sustain an economic crisis in other words. Lack of assets leaves middle strata families vulnerable and feeling vulnerable. In April 2009 there were 5.4 employees seeking work for every available job opening (Shierholz 2009). Finding a job when unemployed is far from being a sure thing. Social mobility is a myth for most Americans particularly the poorest. The myth of mobility has served to gain consent as well as an acceptance of inequality and lack of social programs. The middle class as an ideological support is quite potent. A study by the Pew Research Center in 2008 found that around 40 percent of people with incomes under $20,000 believed themselves to be middle class. The median household income in the United States is about $50,000 and in no city would an income under $20,000 be considered middle range (2008). But the perception of being, or having a decent chance at being plays an important buffer role in maintaining American stratification systems. These are issues that cannot be easily resolved in the current social structure. But populists with easy answers and scapegoats at hand, particularly the less powerful, can find ready audiences for their messages. In this context liberal democracy is seen to distort or corrupt the better instincts of the people, especially the frustrated middle strata. They express a dissatisfaction with the false virtues of the institutional status quo. It is not to be understated that the current context of fascist possibility did not spring up overnight. Like the case of fascism in Germany and Italy it emerges from decades of economic crisis and uncertainty, political economic change and social inequality. This is part of a process evolving over 30 years. Underlying all of this have been the advance of political, economic, and cultural transformations associated with a market fundamentalism, the wholesale handing over of social relations to market logics and market supportive initiatives. The market fundamentalism asserts a morality of austerity and scarcity as public goods. 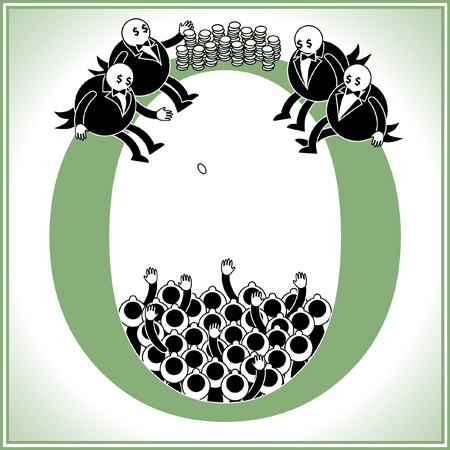 The unequal distribution of wealth is viewed straightforwardly as a proper market outcome. There is no excess for the wealthy since the market only appropriately allocates resources according to the market fundamentalists. Inequality is posed as a natural and legitimate market outcome. Related to this is a sense of entitlement for the privileged and a sense that the poor are undeserving. The current period of fascist possibility emerges from three decades of anti-labor, pro-capital policies instituted as part of mainstream social policy and mainstream cultural values promoted by the state since Reagan attacked the striking air traffic controllers in 1981. It is sometimes difficult to convey to younger people how much the social ethos of public policy and discourse has changed. All of this can prepare the ground for fascist poor bashing, union busting, and corporatism. The great divide in social inequality has also sent a cultural message that some lives are worth more than others. 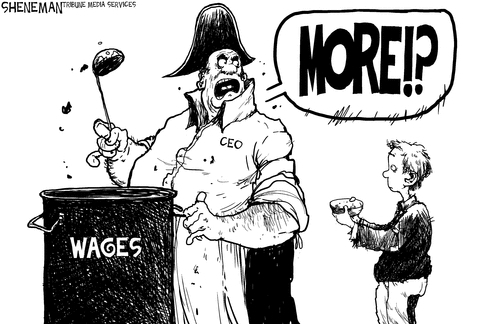 In 2007, the average pay of CEO’s for S & P 500 companies sat at $10.8 million. This was roughly 270 times the average pay of full-time non-management workers which was at $40,000 (Sahadi 2007). In 2015, CEO pay at the nation’s largest companies was 303 times that of the average pay of their employees, according to analysis from the Economic Policy Institute (EPI). The average total compensation of CEOs at the 350 largest firms, including stock options and other bonuses, totaled $16.3 million in 2014, according to EPI. 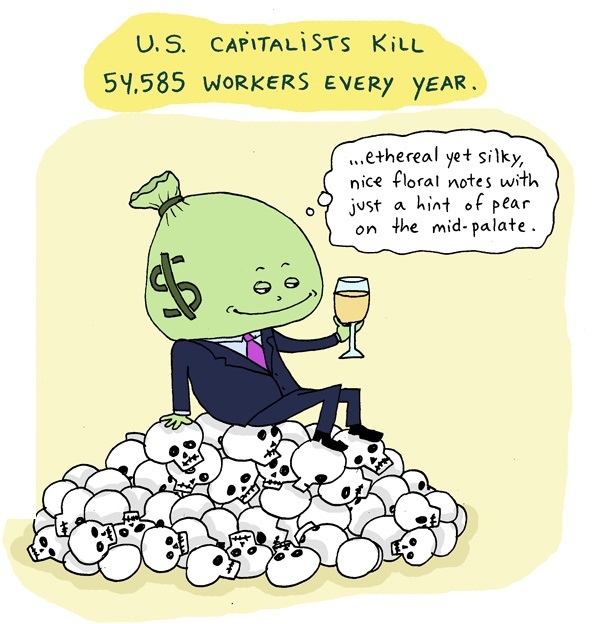 That compares with the relatively miniscule $50,000 in pay for their workers (Isidore 2015). This after downsizing and corporate restructuring and reengineering have decimated blue collar and lower management positions. This has been accompanied by regressive taxation changes. Bruce Judson notes that when Dwight D. Eisenhower took office the top marginal tax for individuals was at 92 percent. Under Reagan these rates were cut from 69 percent when he first entered the presidency to 28 percent in 1988, his final year of his second term in office. In 2006 the effective tax rate (the rate at which people actually pay taxes) for the 400 top earning Americans, those with reported incomes of $263 million or more, was at 17.2 percent (Drucker 2009). Capitalist Warren Buffet reported that he paid lower tax rates than his receptionist. He paid 17.7 percent of his taxable income while his receptionist paid around 30 percent (Murakami Tse 2007). According to Larry Bartels: “[T]he most significant domestic policy initiative of the past decade has been a massive government-engineered transfer of additional wealth from the lower and middle classes to the rich in the form of substantial reductions in federal income taxes” (2008, 161–162). This is further impelled by other social transformations of neoliberal capitalism. A cornerstone of fascism is the assault on unions and other forms or autonomous workers organization. These provide the most potent and durable counter forces to corporatism and far right wing mobilization. In the mid-1950s, 35 percent of US workers were in unions. By 2009 only 7.5 percent of private sector workers and 12.1 percent of all workers in the United States are in unions (Judson 2009, 168). Since Ronald Reagan anti-union actions and ideas have become cornerstones of a certain type of US patriotism (Judson 2009, 168). The current climate in the United States is one of dashed hopes (after the electoral high of Obama’s 2008 election and the end of eight years of Bush) and unmet expectations. There is a lingering bitterness particularly raw among those who were not crazy for Obama in the first place. There is also a solid cynicism (rightly deserved) about status quo politics and the current practice of US democracy (if not the myth of democracy or American political selectness or uniqueness more broadly). The contemporary middle strata in the United States certainly experiences a sense of threatened prosperity and security. Job losses and precarization, threats to pensions, actual losses and decreases in pensions, a perceived loss of social mobility and more. The connection between economic inequality and economic disasters is borne out by the examples of the Great Depression and the Crash of 2008. Both crashes came following the two periods of most extreme inequalities over the last century (Judson 2009, 182). Rising inequality transfers money upwards from those who will spend it more consistently to those who will not. The economy becomes dependent on investment in new projects and on high levels of spending on luxuries which are less predictable. This further renders the economy more precarious. 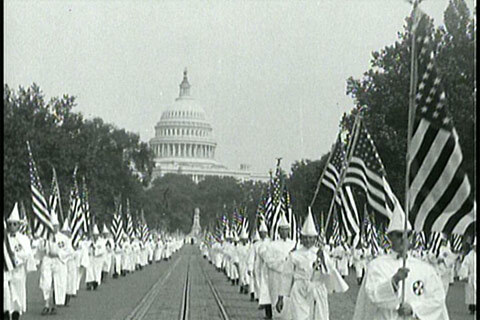 Times of economic turmoil and depression have led to fascist mobilization in the United States previously. In the 1930s the hard populism of Huey Long and Father Coughlin stirred angry, often ugly, passions. At the same time the US offered its own version of a March on Rome when the Bonus Marchers of World War One veterans marched to Washington DC from across the country demanding compensation for their wartime service. Unlike the vacillating state troops in Italy who failed to disperse their marchers, the Bonus Marchers were routed by the army under direction of later war hero, and then discredited war monger, General Douglas MacArthur. Otherwise the outcome might have been quite different. All of this occurred while corporate plotters were looking at an explicitly fascist coup to overthrow Franklin Delano Roosevelt. The United States has come closer to a fascist takeover at the highest levels than may be known, remembered, or acknowledged. In March of 1934 the House Special Committee on Un-American Activities heard testimony from the legendary, highly decorated, retired Marine General Smedley Butler that William Doyle, the commander of the American Legion’s Massachusetts branch and bond salesman Gerald MacGuire had attempted to recruit him to organize a military coup to topple the FDR administration. Butler’s account of events was corroborated by a reporter from the New York Evening Post and the Philadelphia Record, Paul Comly French. French testified that he overheard MacGuire suggest that, “We need a Fascist government in this country to save the Nation from the Communists who want to tear it down and wreck all that we have built in America. The only men who have patriotism to do it are the soldiers and Smedley Butler is the ideal leader. He could organize one million overnight” (quoted in Stone and Kuznick 2012, 64). Testimony in the hearings uncovered the fact that Doyle and MacGuire were fronts for the numerous bankers and industrialists who had formed the American Liberty League to oppose progressive New Deal policies and FDR. For its part the House Committee, chaired by John McCormack of Massachusetts, reported that it was successfully “able to verify all the pertinent statements made by General Butler” (quoted in Stone and Kuznick 2012, 64). It came to the dire conclusion that “attempts to establish a fascist organization in the United States…were discussed, were planned, and might have been placed in execution when and if the financial backers deemed it expedient” (quoted in Stone and Kuznick 2012, 64). MacGuire had gone so far as to travel to France to study fascist veterans’ movements there. He saw these as a viable model for the type of fascist force that could be raised and mobilized in the United States. These bankers and industrialists along with their political agents moved quickly to discredit the claims resulting from the Committee hearings. New York Mayor Fiorello LeGuardia derisively referred to the plans as the “cocktail putsch.” Incredibly the committee chose not to call key figures implicated in the coup plot to testify. These included Colonel Grayson Murphy, Al Smith, John Davis, Hugh Johnson, Thomas Lamot, Hanford MacNider, former American Legion Commander, and General Douglas MacArthur. Butler always expressed disappointment that the names of those involved were left out of the final report—a stunning outcome indeed. In addition to the actual failed coup there were other rumblings very near the president’s office of possibilities for explicit dictatorship. 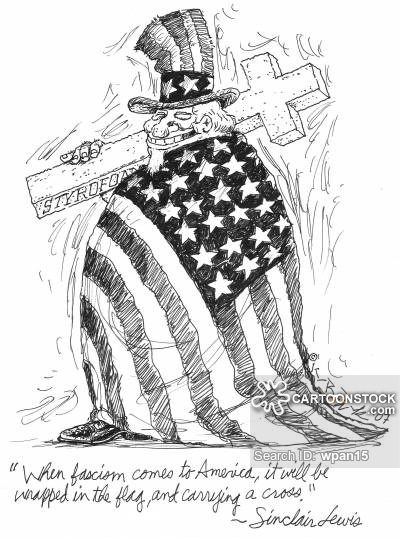 Walter Lippman, a popular columnist and commentator, who was among the first to use the concept Cold War and who coined the term stereotype in its current meaning, wrote that, “A mild form of dictatorship will help us over the roughest spots on the road ahead (Alter 2006, 187). Lippman apparently met with FDR a month before his inauguration to press this idea directly with the incoming president that he might take on the powers of a dictator for an indeterminate period. Far from being a fringe crank with marginal ideas, according to an FDR biographer, Lippman “spoke for the American political establishment” (Alter 2006, 187). In 1932, New York Congressman Hamilton Fish Jr. proclaimed, with regard to dictatorship, that, “If we don’t give it under the existing system, the people will change the system” (Manchester 1974, 58). The very next year Fish Jr. wrote to FDR to assure him that Republicans were prepared to “give you any power you need” (Manchester 1974, 58). FDR himself was said to have contemplated using the word dictatorship in his first inaugural address when he asserted the possibility of seeking “broad executive power to wage war against the emergency” (Alter 2006, 219). And the appeal to exceptional measures in states of emergency is now as much as ever available for politicians seeking to wield them. Aggrieved members of the middle strata express outrage in terms of a loss of values, a change in the American values they knew. This is often posed as a threat to Western values or Christian values. In an earlier work on fascist tendencies in the United States, journalist Chris Hedges focuses exclusively on fundamentalist Christianity. Indeed the fundamentalist Christian strands of authoritarianism and hard populism stretch through various rightist movements from the Tea Party to Patriots. A strange moment came during the 2016 presidential primary season when Dr. Ben Carson, then a candidate for Republican presidential nomination, took a break in campaigning but attended the National Prayer Breakfast. One might suggest that particularly deep, yet largely unexamined, fascist roots in fundamentalism are found in the elite network of The Family, the shadowy grouping behind the National Prayer Breakfast. The faith motivating the National Prayer Breakfast is an authoritarian mix of free market fundamentalism and imperial desire. The shadowy and secretive group has maintained a worship of capitalism and a fondness for dictators. And a strong admiration for the leadership approach of one Adolf Hitler. Sharlet identifies American fundamentalism as exemplified in the family as a movement that recreates theology in terms of empire. It is imperialist. 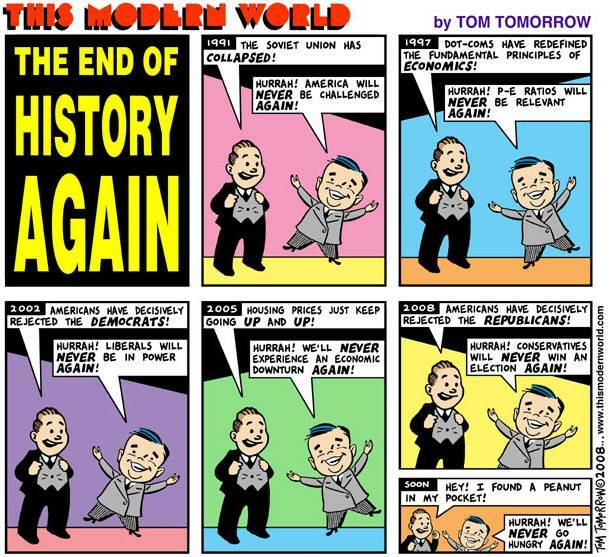 Theirs is a “biblical capitalism” (Sharlet 2008, 3). The Family has strong ties with business people in strategic industries like aerospace and oil (Sharlet 2008, 19). The Family’s headquarters, The Cedars, was purchased with money donated by a CEO of arms manufacturer Raytheon, several oil executives, and other corporate leaders and bankers (Sharlet 2008, 26). Membership in the Family was estimated at around 20,000 (from an insider) with around 350 in central positions (Sharlet 2008, 20). A direct line can be drawn from the corporate opponents of the New Deal to the congressional legislators and fundamentalist Christians who gather each year right up through the 2016 presidential campaigns at the National Prayer Breakfast. Journalist Jeff Sharlet documents relationships of the Family with Nazi business people after World War Two and continued support for dictators through the twentieth and twenty-first centuries. Even more the fascist connections have been direct. In 1963, Family founder Abraham Vereide claimed that the Family had cells in and moved freely in Franco’s Spain (Sharlet 2008, 396). The men of the Family explicitly believe that they are preparing themselves (and the way) for a spiritual war in which they are weapons (Sharlet 2008, 1). The Family instituted an authoritarian faith of and for power alone. One member suggests, as reported by Sharlet, that they were there to “soften our hearts to authority” (2008, 40). Democracy was rebelliousness and the inner rebel must be crushed (Sharlet 2008, 40). 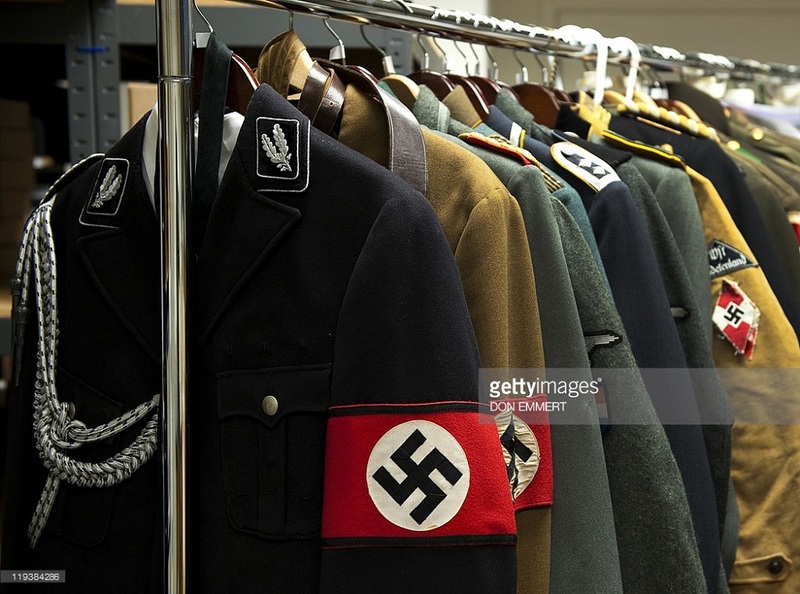 Their respect was paid often to Hitler as an organizing example. One member of the Family gives a fascist description of their bundled strength. In his description: “Look at it like this: take a bunch of sticks, light each one of ‘em on fire. Separate they go out. Put ‘em together, though, and light the bundle. Now you’re ready to burn” (quoted in Sharlet 2008, 3). The Family is little known publicly. Even Hedges gave them no attention in his detailed study. What is known to some of the public and much of the mass media is the National Prayer Breakfast, an event held every February at the Washington, DC, Hilton. Starting with Eisenhower, every president has attended the National Prayer Breakfast founded by Vereide in 1953. The National Prayer Breakfast hosts some 3000 dignitaries who pay a fee (around $450) to attend. These figures are predominantly national political leaders and major corporate players. Most meet for a breakfast and prayer but many stay for days of seminars on Christ’s message for their particular industries (Sharlet 2008, 22). Executives in oil, banking, defense, and insurance take part. Previous attendees include Benazir Bhutto and a Sudanese general linked to the genocide in Darfur (Sharlet 2008, 22–23). The Family’s “key man” in Africa is Uganda’s longtime president for life Yoveri Museveni (Sharlet 2008, 23). The National Prayer Breakfast offers access for these figures to the President of the United States that circumvents the State Department and regular administration vetting (Sharlet 2008, 24). A fascist formation will likely come from within, or in close alliance with, the Republican Party, as the Trump campaign makes rather clear. The Family is composed largely of Republicans in its key circles. It was said to have suggested the pardoning of Nixon to Gerald Ford (Sharlet 2008, 19). President George HW Bush praised Family leader Doug Coe at a National Prayer Breakfast for what he termed “quiet diplomacy” in violation of the Logan Act, one of the oldest laws in the US, which prohibits private citizens from doing that very thing precisely because it raises the prospect of a foreign policy beyond even limited democratic access, accountability, or control (Sharlet 2008, 26). Family founding figure Abraham Vereide had a trickle-down theory of compassion. In this trickle-down view, the powerful must hold large reserves that they can shower on the weak (Sharlet 2008, 89). This was a “big man” view of society and history. Only the “big man” can change the world. What they really seek is a Christian Hitler. Vereide’s vision, which he worked to make real was a “ruling class of Christ-committed men bound in a fellowship of the anointed, the chosen, key men in a voluntary dictatorship of the divine” (Sharlet 2008, 91). For Abraham, the will of god was order, the enemy were not even human (Sharlet 2008, 107). And religion is viewed explicitly to soothe the angers of the poor, to put a cap on their aspirations for social change and economic redistribution to benefit the poor. The vision of Christianity rejected the social Gospel and good works for the poor in favor of a laissez-faire Jesus, bare chested and muscular like Mussolini. Vereide even coined a phrase for his view for the nation (one that George HW Bush would make part of the national lexicon) the “new world order” (Sharlet 2008, 90). The new world order for Vereide was an explicitly corporatist one. It would be based on cooperation between management and labor—in which labor cooperated by submitting and admitting its sins to capital (Sharlet 2008, 112). Tellingly the Family started as a business anti-labor alliance in Seattle in 1935. Notably, the only person Vereide identifies in his early notes as an enemy is a union organizer, likely with the Industrial Workers of the World (IWW), a militant syndicalist union, Harry Bridges, a longshore worker, or Dave Beck, a Teamster organizer in Seattle—or an amalgam of the two (Sharlet 2008, 99). The first task of the elite fundamentalism of Vereide was the destruction of rank and file labor militance (Sharlet 2008, 109). 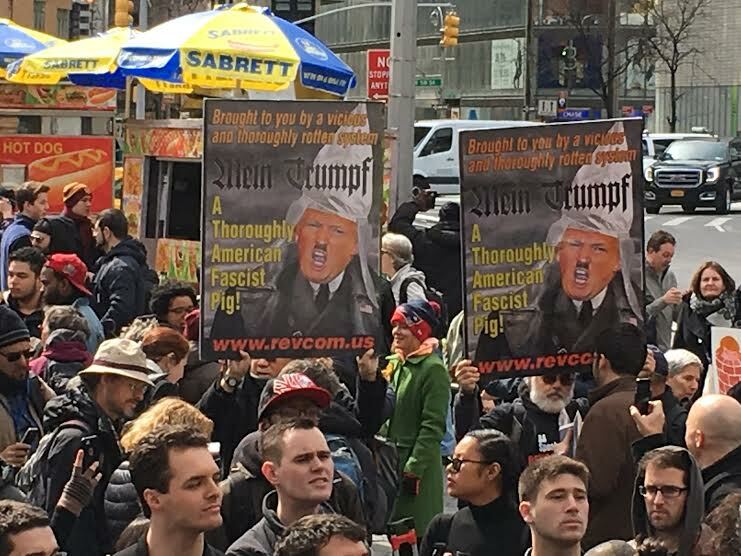 Some argue that despite the rightist anger of the current period and the concerns over the fascist tenor of the Trump campaign the prospects for fascism in the United States are unlikely due to the absence of street fighting brownshirt forces, an apparently crucial component of fascist movements. Yet, one does not need to look very far at present to see that the forces providing potential brownshirt cadres are present and mobilizing. Even more the present period poses the ominous threat that they are converging, the disparate forces of right wing anger and hate seeing and recognizing in each other kindred spirits ready and willing to act together. 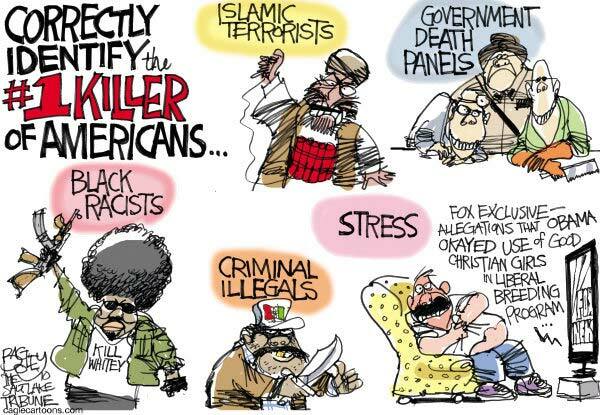 Klan, Patriots, militias, Minutemen, Oath Keepers, Tea Partiers. Those who hold wealth and resources in unequal societies do not give those wealth and resources up without a fight. A move to fascism may be an effort to head off attempts at social reform or wealth redistribution. This impetus has played a part in the right wing militia and Patriot movements which are in large part responses to civil rights movements and advances made by social minorities in the US since the 1970s. 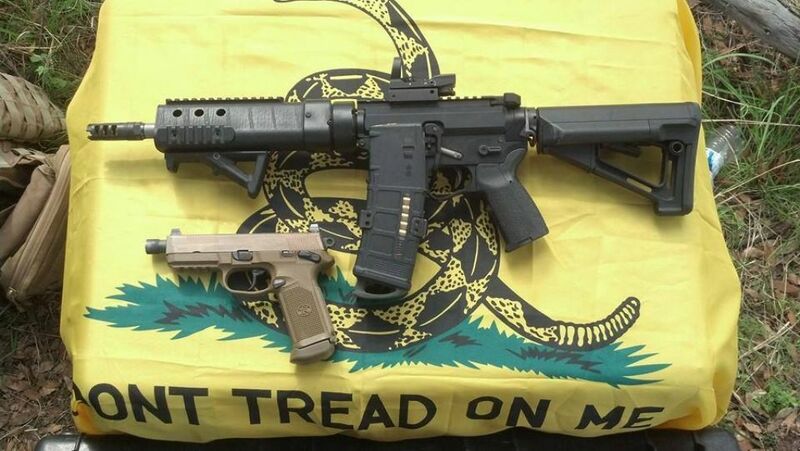 On Saturday, January 2, less than 48 hours into the new year of 2016, several hundred armed right wing militia members, self-styled patriots, affiliated with the Bundy Ranch in Nevada marched on a federal building in Oregon, took it over, occupied it, and vowed to defend it with arms. The patriots, claiming to be defenders of the Constitution, called on others sympathetic to their cause to take up arms in a show of force and support. The reason for the occupation of the Malheur National Wildlife Refuge building was outrage at the conviction of their allies, Dwight Hammond and his son Steven Hammond, convictions that the Bundy militia view as unconstitutional. This is but one of the recent, very public, mobilizations of right wing armed groups in the United States. Notably, like others before it, the Bundy militia was able to march openly en masse while armed with automatic assault weapons in full view of police who did nothing to discourage or halt their assembly or advance. One might well contrast this with the extreme, usually lethal, violence deployed against African American civilians, including youth and children armed with nothing more than cell phones or toys, if that, by militarized and trigger-ready police force in various sub/urban contexts across the United States. The police (non)response to organized, angry, armed right wing militia groupings is also a far cry from the extreme violence regularly deployed against non-violent protesters and progressive and left wing activists at social justice demonstrations, alternative globalization protests, and Occupy actions and encampments. 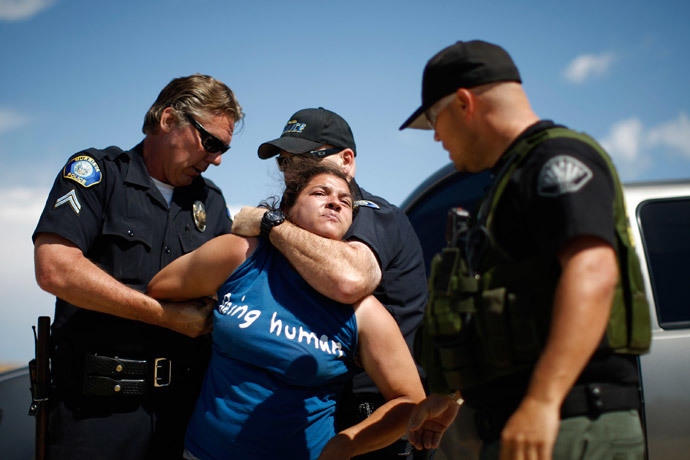 In each of those cases people have been subjected to police assaults, use of munitions including tasers, rubber bullets, tear gas, pepper spray, kittling, mass arrests, and detentions. Student protesters doing nothing more than sitting down on their own campus grounds have been subjected to beatings and pepper spraying by police. All of this sends a clear message to would be brownshirts that the state will target their enemies, anarchists, leftists, progressives, etc. for extreme, even lethal force, while offering minimal or no intervention in the face of armed and aggressive rightist mobilization, even large scale actions designed to show force and intimidate local populations. This is a key element in the rise of openly fascist movements. At this point in time it is clear that brownshirts in waiting appear across the landscape of politics in the United States. These include, but are not limited to, militia groups, Tea Party supporters, the Klan, Oath Keepers, Patriots, and border patrols like the Minutemen, in addition to explicitly neo-Nazi groups. What is perhaps emerging in the present period is the convergence, and more open convergence, of these groupings under the “Make America Great” Trump banner. This may be a convergence that propels the would-be brownshirts into actual brownshirts on a broader, organized, basis. Though that point has not yet arrived. One of the formations that may most likely coalesce into a street fascist point of convergence are the border militias. Border militias are organized groups of armed citizens in the United States who mobilize to patrol the border between the US and Mexico and interfere with the movement of immigrants from Mexico into the US. Militia patrols have been most active in Arizona and Texas. It is estimated that there are as many as 500 militia troops currently patrolling the US-Mexico border in Arizona. Most militia patrols are made up of small groups, however, with patrols generally consisting of fewer than a dozen members. In addition to physical patrols of border areas, militias have engaged in political pressuring, especially through rallies and protests, of politicians to pass restrictive immigration laws, to deport migrants, and to toughen border security. Militias have also mobilized political campaigns to defeat politicians deemed to be “soft” on immigration reform. In addition, militias have waged publicity campaigns demonizing immigrants deemed to be “illegal” (or who have entered the US through unofficial channels). Militias typically operate on their own with no oversight from state authorities at any level. They do not formally coordinate their efforts with the US Border Patrol and do not communicate their movements or actions. Most militia members have no formal firearms or tactical training, nor do they have training in conflict resolution or de-escalation or health issues. Indeed the border militias are strictly vigilante groups who operate according to their own sets of rules and responsibilities. At the same time there have been reported instances of Border Patrol agents cooperating with militia groups and providing logistical support (map readings). Militia members report receiving positive feedback and support from Border Patrol agents. Publicly, US Customs and Border Protection (CBP) disavows the militias and cautions against their activities. Serious concerns have been raised about the nativist, and indeed explicitly racist expressions and practices of border militia groups. Even more there have been cases of physical violence inflicted by militia groups on migrants they claim to have intercepted crossing the border. Border militias have also been associated with racist extremists and white supremacists, either directly through militia membership or through appearance at militia events. 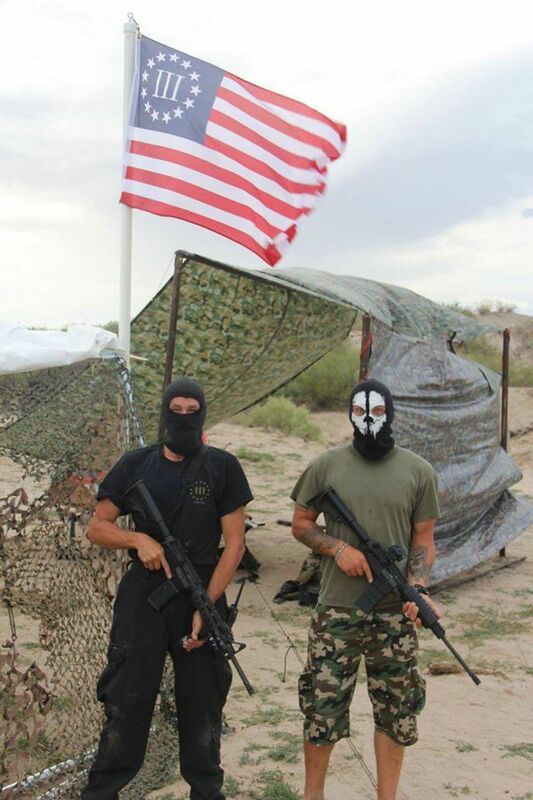 Neo-Nazi groups have openly participated in border militia rallies. 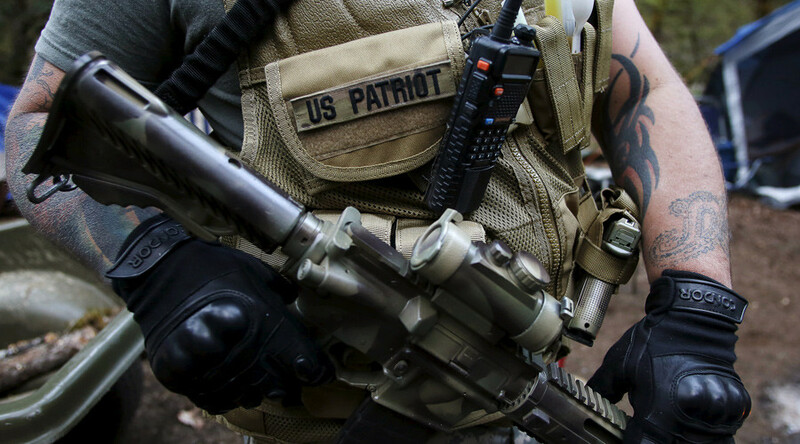 The Southern Poverty Law Center, a major civil rights group and human righst monitor in the US, has designated the Minutemen militia an “extreme nativist” group. Due to the clandestine and secretive character of most of the border militia groups (including the widespread wearing of bandanas and camouflage to mask individual identities) little is known about the composition (class, culture, background) of militia group membership. Perhaps not surprisingly most attendees at open militia events are of Euro-American backgrounds (i.e. white). Militia members are believed to come from a range of socioeconomic strata and occupational backgrounds. The formation of border militias speaks to the intersection of socio-political developments in the twenty-first century. These include economic crisis, deindustrialization, and increasing unemployment which give rise to and reinforce fears of job loss (conceived as being lost to lower cost migrant labor, for example). 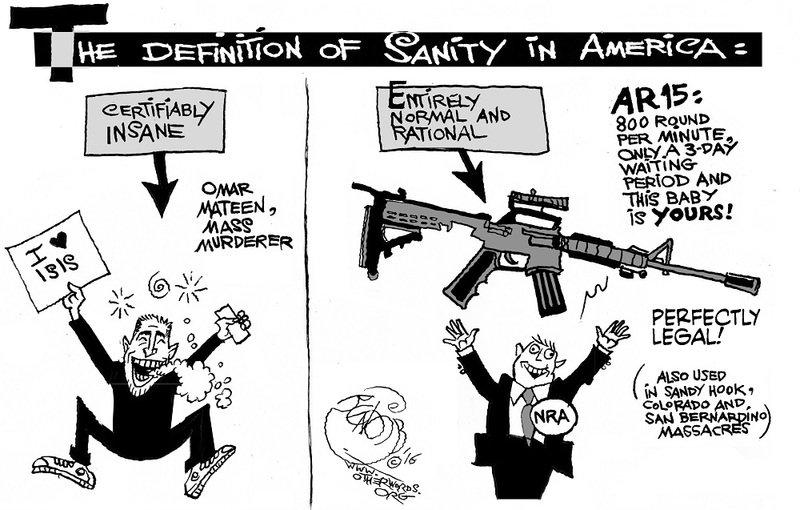 There is also the socio-political climate stoked by fears of terrorism and terrorists following 9/11. Along with this are growing phobias of the migrant “other” associated with fears of infiltration or invasion. These come together with demographic changes in the US, including growing visible minority populations, and shifts in political influence and policy (real and/or perceived) that reinforce anxieties among Euro-Americans over a loss in privilege or status. There is also a political distrust of government efficiency reflected in movements like the Tea Party. In these contexts the border militias, like the Tea Party, express a form of activist reactionary politics. The border militia group that has gained the most notoriety, nationally and internationally, is the Minutemen, founded in 2005 to patrol the US-Mexico border in Arizona and with the stated aim to intercept and return migrants. Co-founded by Jim Gilchrist, the Minutemen take their name from the Minutemen militias that fought during the American Revolution. The nod to the American revolutionaries, and the hard nativist discourse espoused by Minutement leaders and general members mark the Minutemen among broader Right wing populist movements, such as those associated with the Tea Party movement of the Republican Party. The Minutemen have been lauded by well known conservative public figures including Arnold Schwarzenegger, who praised the Minutemen while governor of California, and media figure Sean Hannity. Schwarzenegger invited the Minutemen to patrol the border between California and Mexico. 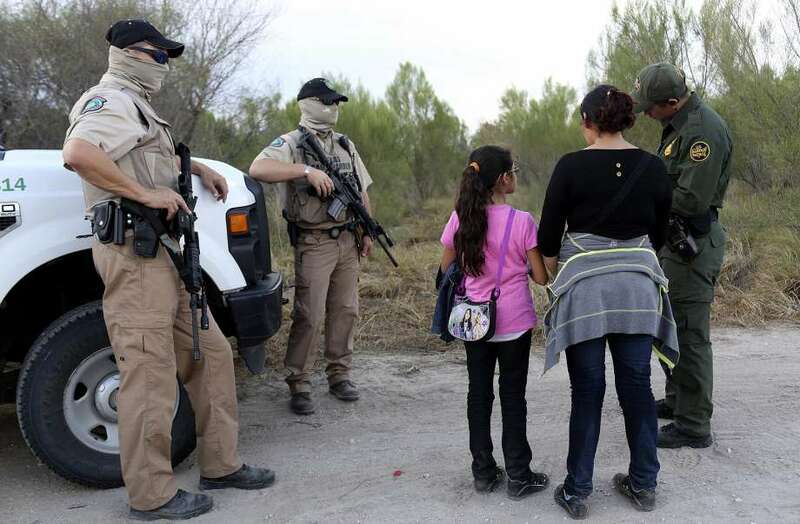 During the summer of 2014, militias mobilized in mass numbers to patrol the Texas-Mexico border, after US Border Services and Texas Governor Rick Parry reported growing numbers of migrants from Central America. As a result the US Border Patrol was moved to warn off militias publicly, requesting that they not get involved. While more than ten militias are said to be active in Texas, most are made up of fewer than a dozen members, leaving roughly 100 members actively patrolling. Republican state Representative Doug Miller, a three-time representative, publicly praised the militia for their activities in Texas. 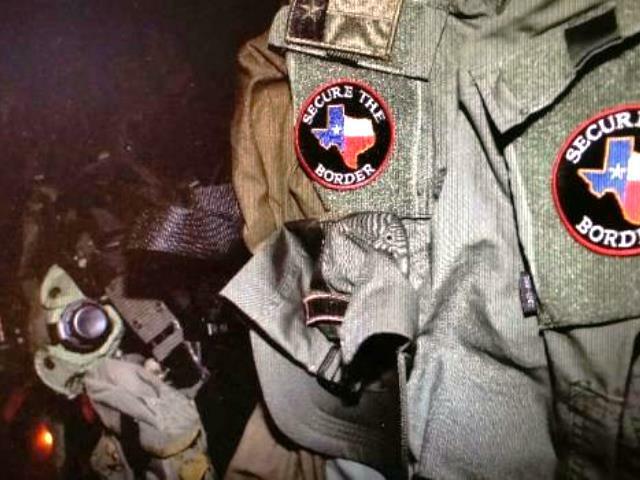 Groups operating along the border in Texas include Operation Secure Our Border: Texas (formerly Operation Secure Our Border: Laredo Sector), the Central Valley Citizen’s Militia, the Independent Citizen’s Militia, Bolinas Border Patrol, Alpha Team, Bravo Team, Camp Geronimo, Whiskey Bravo, and the Oathkeepers. Militias have recently taken to coordinating their efforts across groups and locales. They have established the Patriot Information Hotline, a 24-hour conference line maintained by militia groups to coordinate their efforts. In response to the border militia movement there have been mobilizations opposing militia groups publicly. Opposition has particularly strong among anti-racist activists, Leftwing groups, immigrant defense movements, and African American and Latin American groups. In 2005 a mass demonstration of more than 300 people, including members of the League of United Latin American Citizens, attempted to stop a speech by Minutemen members, one of whom was founder Jim Gilchrist. Police intervened to end the protest by declaring it an unlawful assembly. Students and community groups have confronted Minutemen representatives on various campuses across the US when the militia group has attempted to address college and university audiences. In 2006 several dozen students and community organizers disrupted a presentation by Minutemen members at Columbia University in New York City. Protesters took the stage to halt proceedings while chants decrying racism within the border militias were leveled from the audience. Again, security intervened to break up the protests and allow the Minutemen to continue. The Southern Poverty Law Center suggests that the border militias have been most involved in heated rhetoric against immigrants and immigration, a concern in and of itself, but have actually undertaken few initiatives outside of some cases in Arizona and recent events in Texas. At the same time the border militia movement, and especially the Minutemen, have been of great interest to national and international media and played a part in public debates about immigration and immigration reform in the US. They have been particularly influential in promoting punitive and restrictive approaches to immigration. 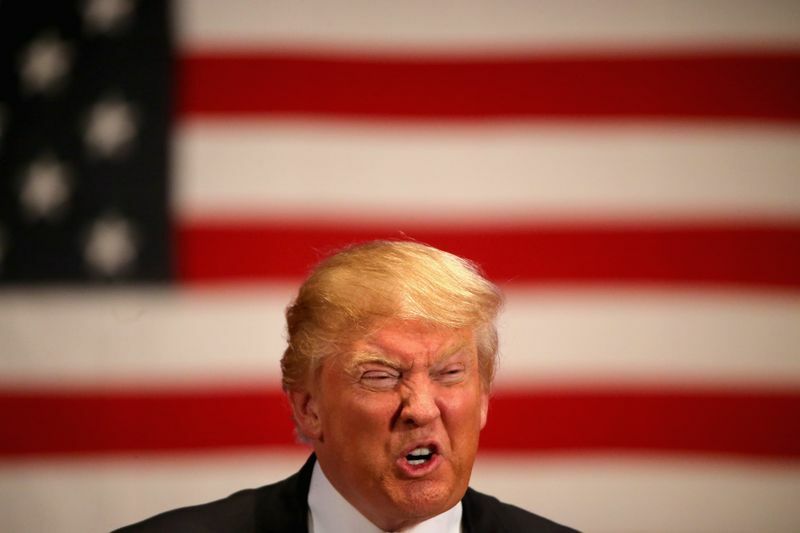 Obviously the campaign of Donald Trump for Republican candidate for president has raised the prospect of a mass mobilization along fascist lines in the United States. 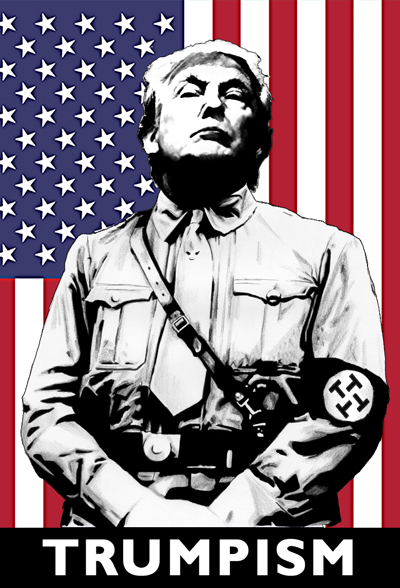 Of perhaps greatest significance the Trump campaign shows the very real coming together of elements of high (elite, corporate, government) fascism and low or street fascism. In Trump’s campaign the prospect of a rightist demagogue gaining control of the instruments of government, and the already existing high fascist mechanisms comes together along with, and through, the mass mobilization of fighting forces in the streets (and campaign rallies). This is a significant shift in politics in the US (in scale certainly if not in character) and has brought developments that have been previously seen as fringe (individuals at Tea party rallies or Patriot meetings) or obscure into the mainstream and into day to day politics on an open basis. It shows too that fascist mobilization or development in the United States need not be, and will not only be, friendly. Whatever the specific outcome of the Trump campaign for the Republican leadership or the presidency, the terms of analysis and action in the United States have shifted. The mechanisms of fascism within existing government structures are in place and available for expansion or further deployment by a rightist demagogue. The actors who favor and promote them are in place. Even more, the low or street fascist elements have become more organized, open, engaged, and confident. They have found a safe space for open mobilization, their ideas given daily broadcast in mainstream media. They have found their audience. 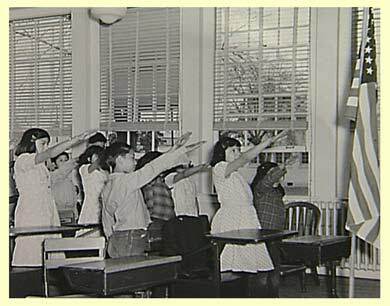 They now feel secure in stepping forward right arm outstretched, reaching for their very own führer. Akers Chacon, Justin and Mike Davis. 2006. No One Is Illegal: Fighting Racism and State Violence on the US-Mexico Border. Chicago: Haymarket. Alter, Jonathan. 2006. The Defining Moment: FDR’s Hundred Days and the Triumph of Hope. New York: Simon and Schuster. Bartels, Larry. 2008. 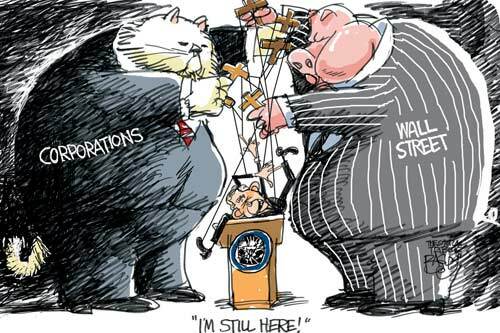 Unequal Democracy: The Political Economy of the New Gilded Age. Princeton: Princeton University Press. Doty, Roxanne Lynn. 2009. The Law Into Their Own Hands: Immigration and the Politics of Exceptionalism. Tucson: University of Arizona Press. Manchester, William. 1974. The Glory and the Dream: A Narrative History of America 1932–1972. Boston: Little Brown. Neiwert, David. 2013. And Hell Followed With Her: Crossing the Dark Side of the American Border. New York: Nation Books. Ramadan, Hisham and Jeff Shantz. 2016. Manufacturing Phobias: The Political Production of Fear in Theory and Practice. Toronto: University of Toronto Press. Rappaport, David C. 2008. “Before the Bombs There Were the Mobs: American Experience with Terror.” Terrorism and Political Violence 20(2): 167–194. Reich, Robert. 2002. I’ll Be Short: Essentials for a Decent Working Society. Boston: Beacon Press. Shantz, Jeff (ed.). 2010a. Racial Profiling and Borders: International, Interdisciplinary Perspectives. Lake Mary: Vandeplas. Shantz, Jeff (ed.). 2010b. Racism and Borders: Representation, Repression, Resistance. New York: Algora. Sharlet, Jeff. 2008. The Family: The Secret Fundamentalism at the Heart of American Power. New York: Harper Perennial. Stone, Oliver and Peter Kuznick. 2012. The Untold History of the United States. New York: Gallery Books. UN-Habitat. 2008. State of the World’s Cities 2008/2009: Harmonious Cities. London: Earthscan. Wolff, Edward N. 2007. “Recent Trends in Household Wealth in the United States: Rising Debt and the Middle Class Squeeze.” Working Paper 502. Levy Economics Institute of Bard College.